With the death of Julia Sit, the riding community lost one of its most involved members. It seemed an especially unnecessary tragedy since she herself had lost her partner in a riding accident almost exactly a year previously, and now her loss was being felt by her new fiance and almost everyone in the riding community. It seemed like even people who’d never met her felt like they knew her. 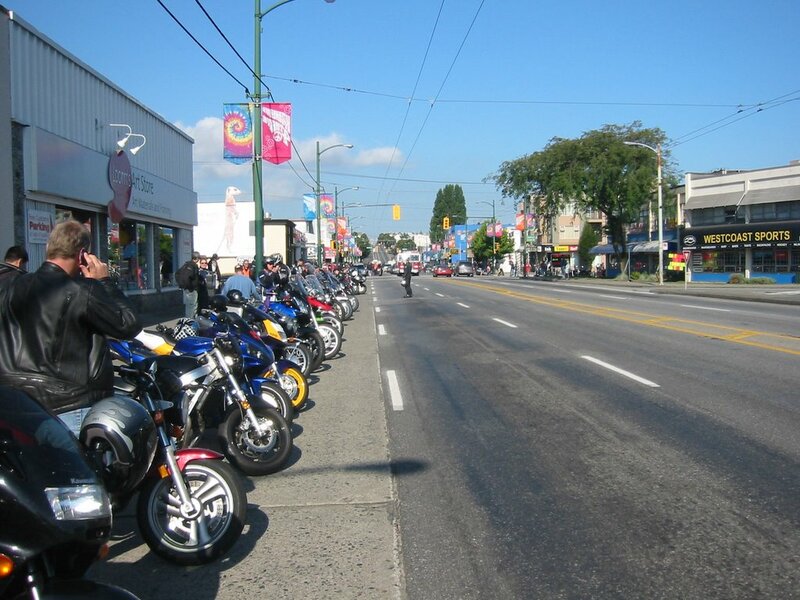 She’d run a coffee shop for her parents, the Flying Swan, and made it into a motorcycle friendly cafe, hosting many events, including New Riders’ Nights to teach new riders about motorcycle safety. 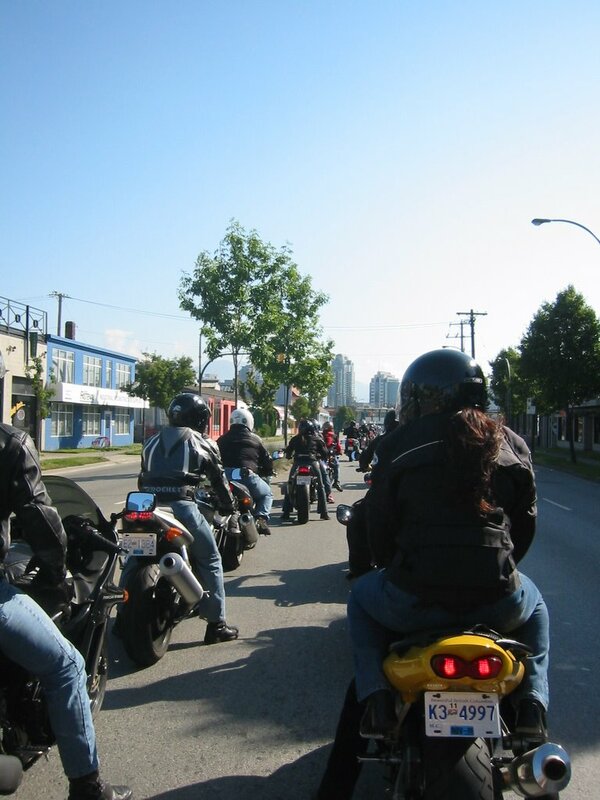 Thus it was that her memorial ride turned into one of the largest ever. There were bikes lined up and down the streets around the Flying Swan. 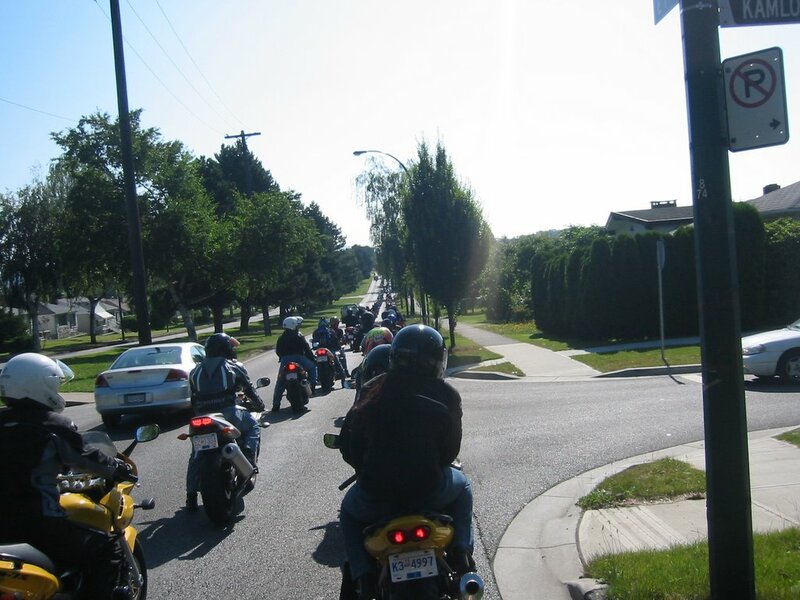 The ride was well organized, and rolled out without a hitch – I was near the end and got to watch all the other groups who’d come out – and it was indeed a diverse group, including Sikhs on cruisers, an estimated 700 bikes in all. The ride was mostly OK, and it was great how riders would hop off to hold up traffic for the procession and then leap ahead to do it again. The pace was slow, and I managed to get a couple pictures in – they don’t really capture how amazing it was to see nothing but a double ribbon of shiny bikes stretching as far as they eye could see and then moving on. With the second picture I stalled my bike and fell behind my friends, but then fell in later. I think it wasn’t until this ride that I really felt anything deep inside about Julia’s death. I find it hard to process that someone is gone until I see something like this memorial. I know it wasn’t until my grandfather’s funeral that I really started to cry and feel his loss. Several times during the ride I found myself tearing up and small sobs coming up. I had only met her a few times this year but I’d been impressed with how she made a group of strangers into friends, and she got to know everyone and accepted them all into the group – she was just so darn friendly. How can someone that full of life just be gone, at least from here? I couldn’t believe it when I heard it, and it took this memorial ride to make it real.